Claremont, Calif. (July 5, 2017)—Professor Donald McFarlane and a team of researchers are developing a new way to plumb the depths of volcanic crater lakes around the world. 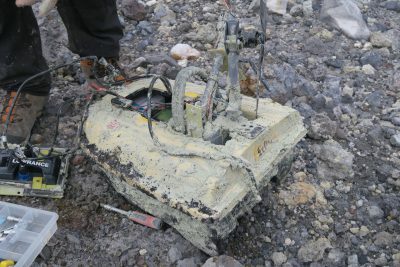 Adapting aerial drone technology, they designed and deployed a small sonar-equipped boat to survey Laguna Caliente, a lake in the crater of the Poás Volcano in Costa Rica. Findings from their first experiments with the autonomous craft were published in Eos, a leading publication of Earth and space sciences news. 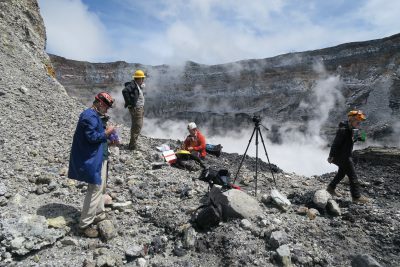 Volcanologists study crater lakes to monitor volcanic activity, but it can be an imprecise science, frequently relying on simple geometric formulae to estimate the volume of water, according to McFarlane, a professor of biology and environmental science at the W.M. Keck Science Department, a joint program of Pitzer, Claremont McKenna and Scripps colleges. Getting more exact measurements is tricky. These active crater lakes are caldrons of scalding, sulfuric water that periodically erupt. The water of Laguna Caliente, which translates to Hot Lagoon, is more acidic than battery acid. The eruptions can make volcanic lakes “too dangerous for human inspection by inflatable boat or raft,” according to McFarlane’s Eos article “An Autonomous Boat to Investigate Acidic Crater Lakes,” which he co-wrote with Joyce Lundberg, Guy van Rentergem and Carlos J. Ramírez. Based on his experience using drones for caving expeditions and tropical rainforest research, McFarlane presented the idea of creating an autonomous, aquatic drone to a colleague who builds drones for research projects. The result is an approximately 21-by-15-by-9-inch plastic bait boat covered in epoxy and rigged with sonar. The boat’s propeller sticks up into the air instead of down into the acidic waters that would eat through a standard metal drive shaft. The research team took the boat out for its first test run last summer. Wearing helmets and respiratory masks, they programmed the craft to chart a set course and launched it on Laguna Caliente. A few feet from shore, it disappeared from sight, swallowed by the sulfuric steam clouds rising from the waters. The aquatic drone was programmed to return to its starting point, but it didn’t. As the researchers tried to determine why it had stalled out, an eruption went off, inundating the craft with acid. The boat eventually washed up on the shore at the bottom of a cliff. McFarlane rappelled down to retrieve it to find that acid had gnawed through the cable contacts, but the hardy craft had retained all its data. Based on that information, the researchers could calculate the volume of Laguna Caliente and map the bottom of the lake. 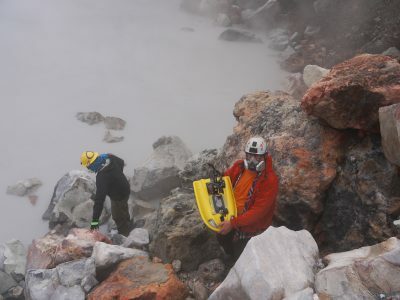 “Through custom-built ASVs (autonomous surface vehicles) equipped with sonar and other sensors, scientists can gain a valuable new tool for the exploration and monitoring of remote and hazardous volcanic lakes,” the authors conclude. This project is a new venture for McFarlane, who treks to the far corners of the earth to explore biological wonders of the world. He is a noted expert in speleology, or cave science and has received multiple awards from the National Geographic Society’s Global Exploration Fund, including grants that have supported expeditions to the Gomantong Caves in Borneo. A member of the International Society of Explosives Engineers, McFarlane is president of the Commission on Archaeology and Palaeontology of Caves, Union Internationale de Spéléologie. He has published more than 100 articles on his wide-ranging research interests, including paleontology, paleoecology and the ecology of extinction and cave ecosystems. He has led numerous student research projects at Pitzer College’s Firestone Center for Restoration Ecology in Costa Rica, including his most recent drone research that documented reforestation at the Firestone Center. McFarlane earned his undergraduate degree at the University of Liverpool, his master’s at Queens University of Belfast and his PhD at the University of Southern California.